To try for bariatric fit. To help my mother feel more comfortable without worrying about leakage. 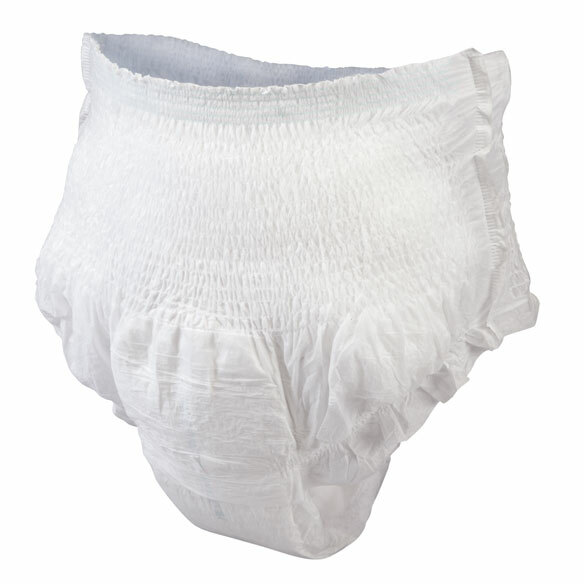 Padded sides on any men's diapers? BEST ANSWER: Thank you for your question. Unfortunately no, there are no pads on the sides. We hope this information will be of help to you. what is waist size on L/XL? BEST ANSWER: Thank you for your question. The waist sizes are listed in the description as follows: S/M (32" - 44"), L/XL (44" - 58"). We hope this information will be of help to you. does the size run large? I weigh 275lbs so will this fit me? BEST ANSWER: Thank you for your question. The sizes are based on waist size. S/M (32" - 44"), L/XL (44" - 58"). We hope this information will be of help to you. are these washable or one time use and dispose? BEST ANSWER: Thank you for your question. These are disposable. We hope this information will be of help to you. BEST ANSWER: Thank you for your question. Unfortunately they do not come in a XXL. We hope this information will be of help to you. Do the sides pull apart for easy disposal for Unisex Protective Underwear? BEST ANSWER: Thank you for your question. The sides do not pull apart, they are designed like regular underwear. We hope this information will be of help to you.